We reached a fun milestone at the Campbell house last night. I came home with a car for my sons. We staved off this decision for as long as we could for a combination of both money and principle but with Alex and Brian graduating this spring, and Brian staying local for college and living at home next year, it was time. Which of course, brought me around to thinking about first cars, my first car, other people’s first cars, etc. etc. I think getting your first car must be a uniquely American rite of passage (and I’d love it if my pals in the UK could weigh in on the concept). And I think it’s probably a bigger deal for males than females, although I do know a lot of girls that love their cars and were so excited with their first cars. The timing of a first car is also an interesting thing – I do know many people that got their first cars on or around their 16th birthday – and it was truly a car for them. The really lucky ones (and some might say spoiled) got NEW cars for that occasion. Then, there were those of us that got cars at a later age. I got my first car the summer before my junior year in college. My sister got her first the fall of her junior year in college. My folks were of the opinion that high school kids didn’t need cars of their own, and the family ride was perfectly fine. Considering that my dad liked to have a fairly new car as the family car, and we liked a bit of luxury, though in a Midwestern, conservative vein (think Oldsmobile, versus Cadillac), I always had a nice car to take on dates. Whereas I think if the folks had gotten me a car of my own, it would have have been a smaller, not as nice car. I’ve always been “a car guy” though – I love the damn things, much to the disdain of my finances. I’m sure my net worth would be a six-figure number higher if I’d driven tired rides to their graves versus buying or leasing new cars every 3 or 4 years through most of my adult life. But, I wouldn’t have had as much fun and at the end of the day, life is worth living. And since cars are a part of my life, it’s been a worthwhile and necessary expense. My first car therefore, was a great “car guy” car – high performance, super fun to drive, etc. 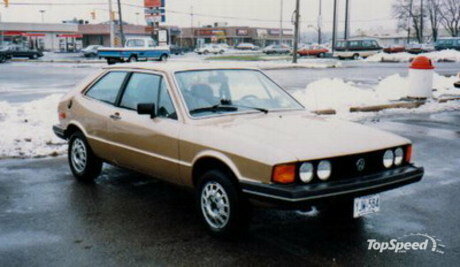 A 1979 VW Scirocco. (while the picture at left isn’t mine, mine looked exactly like this) It was just at 4 years old when we bought it, had about 60,000 miles on it, and ran like a rocket. In a day where 5.7 liter V8 engines in Corvettes and Camaros and Mustangs were smog-controlled back to about 165 HP, my little Scirocco cranked 115 hp from it’s 1.8 liter 4 cylinder in it. And because the car weighed all of 1950 lbs, it’s power to weight ratio was better than that in a Firebird Trans Am. And that made it just as fast. The best/funniest thing about it was my Dad – any time I pulled my car into the driveway behind his, it would be gone the next morning – he loved that little thing and it’s 5-speed manual transmission and thundering stereo. He would pull off the sunroof panel (remember those? ), pop in a cassette of Beethoven’s 9th symphony, slap it into gear and blaze off, redlining the engine on every shift. I remember the day we went to buy it like yesterday. My Dad had given me a car shopping budget and basically no parameters beyond mileage – not more than 70,000 miles, and not more than $4000. Beyond that, have fun. I knew about Sciroccos and VW Rabbit GTIs (not coincidentally my current car is a 2011 VW GTI), and so I looked at those as well as other sporty import cars and few others. I knew I wanted small and light, with great handling. I didn’t want a Camaro or Firebird, and Mustangs were just awful at that point. I found this at a dealer about 30 miles away. I came back, told my Dad about it, and the following Saturday, we went to look at it. He had done some research on it and had called the previous owner. It was a solid car. Unbeknownst to me, he had already called the dealer and negotiated a final price, so when we showed up, we went for a fast test drive, which my Dad drove of course, and when we came back, the salesman (and through a fit of “why is information like this still in my brain”, I still remember his name – Dennis Matney) was standing there with a file folder in hand. We hopped out and my Dad turned to me and said “So?” and I said to him “Umm, So?” and he said “Is this the car you want?” I smiled and said “Yup, that’s the car”. He turned to the salesman and said “Ok, let’s do this.” He pulled out his check book, wrote a check for $3600, and the salesman handed us the paperwork. We were done in less than 5 minutes. I was in heaven when he dropped that key into my hand! As a dad, I’ve been looking forward to yesterday for forever. After looking for a bit and trying out a bunch of cars ranging from a very tired old Blazer all the way to a perfect condition 2000 Mercedes Benz CLK320 convertible (that would have been Robin’s and they would have gotten one of our current cars to drive), we settled on a Honda Civic – it was owned by a work colleague of a good friend. 2008 model year, only 40,000 miles. Looks and runs like a brand new car. And only $10,000. While at the top of the budget we set, considering its age and mileage, it is worth the investment. We also were of the opinion that 16 year olds do not need cars – they can bum rides, take our cars, etc. And we’ve always had a fun ride in the house. To wit: Poor Joel, our oldest son, when he first got his license had to choose between a 2004 screaming yellow, 240 HP, rear drive, 6 speed manual, Mazda RX-8 sports car, or an electric red, convertible, every-option 2002 BMW 330 Ci. Poor kid. That said, Alex and Brian, as much as Joel IS a car guy and a driving addict, are not even licensed yet. At nearly 18 years old. It just hasn’t been something that’s been a priority for them, and well, if it’s not their priority, why should I push them? While I’ve saved a ton of money on car insurance, it’s now time to get licenses. So on Sunday when we called them after buying it and said “Guess what? We bought you a car!” we were met with, “Oh, Ok. Thanks. Umm. Yeah.” Not exactly the fist-pumping excitement I had hoped for. But, I got the reaction I wanted last evening when I brought the car home. Suddenly it became tangible – they have a car. And so, the excitement came through. While not fist pumps, I sure got high fives and hugs. I’m sure they’d have been more excited if they were licensed and could go motor off in it but, they are not. So the game plan is to have them drive nothing but their new Civic for the next few weeks, and then they will get their licenses in time for graduation. And then the true reality and freedom of the road will be upon them. God help me and them and my insurance rates! 1984 VW GTI… loved that car!